Malaysian crowds are really sad, as usual. Why don't they even cheer as a symbol of support to the person performing on stage?? They're just so...unsupportive -_-. 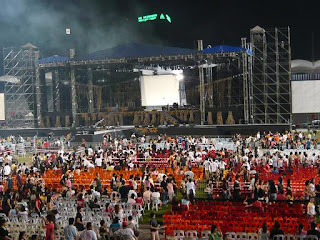 That was what exactly happened at Leo Ku's concert. The concert was pretty okay. Wasn't as bad as I thought it would be cuz Leo Ku can really sing live. It's just that his songs are not to my liking but that's besides the point. Being a non-fan, I could at least present a more objective perspective in this concert report. Btw, the verdict had been revealed. It was decided that me & my sis attend the event. Since our tickets were free seatings, we knew that we had to be there quite early to reserve a good spot. 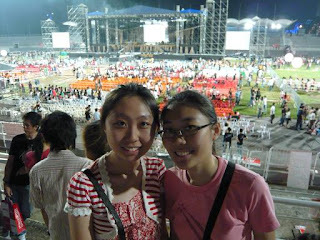 Me & sis arrived at about 6pm (the concert is scheduled to start at 7.30pm). There was a long queue at the entrance to the arena as expected. Fifteen mins later, everyone entered the stadium & (surprisingly) didn't rush to grab good seats. Again, that's incomparable to Dong Bang's. Both of us walked briskly to find the perfect spot for the best viewing experience. Not that it made much difference cuz the arena is pretty far from the stage. 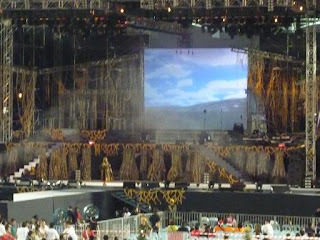 I shall start by describing the stage set-up. It's a pretty decent one - not too extravagant to the point of being labelled "overly done". 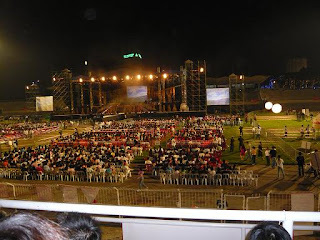 What more can the staffs do since this is an outdoor stadium. 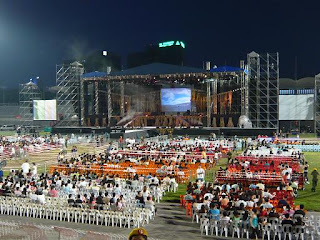 Apart from the good thing about open space, a lot of stage effects & pyrotechnics are compromised when holding a concert outdoors. I waited for about an hour or so & still there were no signs of other ppl coming to sit at the more expensive areas. It felt so awkward to see that Leo Ku's fans ain't enthusiastic at all. Or perhaps I was too used to passionate Dong Bang fans who're always punctual for any Dong Bang events. 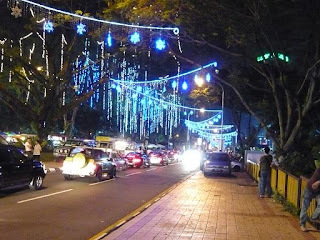 And the latecomers did reflect how un-punctual Malaysians are -_-". 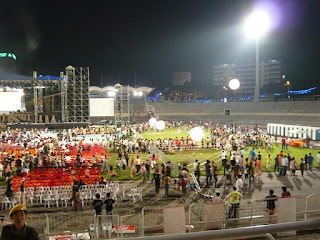 At approx 7.40pm, ppl start pouring into the stadium & slowly filling up the empty seats on the field. By 7.50pm, all the seats were filled up. The concert officially started at 8.05pm with stage lights flashing at intervals. 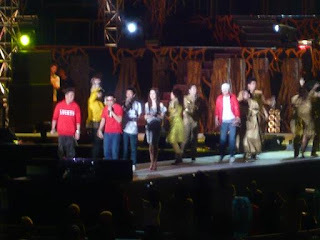 Seen here is Leo Ku MC-ing after the first song. To my surprise, his jokes turned out to be witty & hilarious. Thumbs up! Basically, he continued crooning numerous slow ballads after all the MC-ing. There're not much pics to upload here since 80%-90% turned out really blur. The rest are fancams which would take hours for me to upload thanks to stupid Streamyx. The video sizes are just too big! Nevertheless, the few pics below imho are the few best scenes throughout the night. Love those captivating stage lights. Underwater scene with jellyfishes floating about. Prince Charming meets Lady Princess. 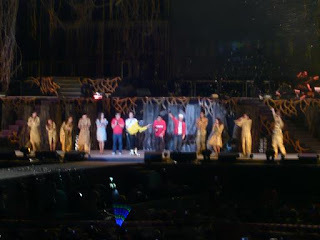 When guest artiste for the night appeared, we were screaming hysterically XD. Yes, it was indeed Justin. Seems like the girls who sat behind us came cuz of Justin. So do I. Gosh! I sounded so evil :P. Anyways, I dun have any pics of him as it was really difficult to get a clear shot of him. Don't forget that I was sitting really far away from the stage. Speaking of costumes, the pic below showed Leo Ku with a pair of humongous wings strapped to his back. The wing looked ugly; like a devil's wing -_-. What was the wings for anyway? Later, Justin & the other 2 guest artistes who also co-performed that night were dancing away on the stage together with the dancers. They were even jiggling away to Christmas songs. Obviously the show was coming to an end very soon. 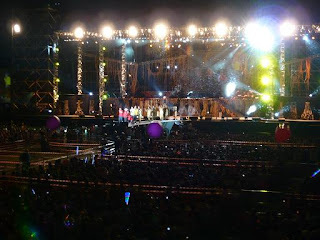 Giant balls were tossed to the crowd as part of the Christmas celebration too. Large crowd leaving the stadium. 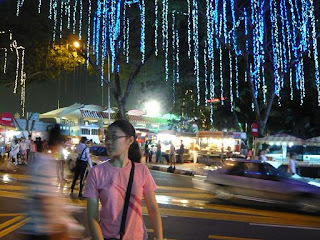 A proof of our existence at the concert~ Look at my dishevelled hair & blouse -_-"
The hustle & bustle of night life in the heart of KL.